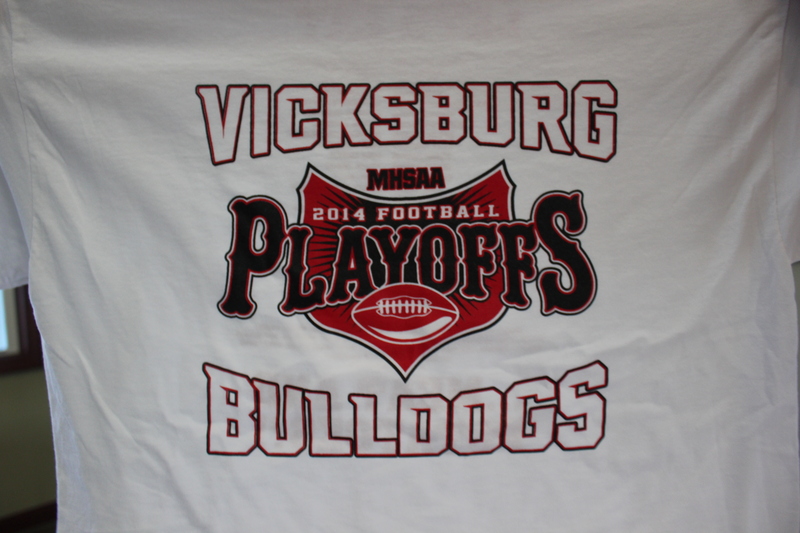 The Vicksburg Bulldog football team gets another crack at the Three Rivers Wildcats as they will face off one more time in the 2014 season in the first round of playoffs, at 7:30 p.m., Friday, Oct. 31 in Vicksburg. This marks a turnaround for the program that went 3-6 last year. Mike Roy pointed out to the team at their TV selection viewing party on Sunday night of history in the making. Vicksburg has never hosted a home playoff game, especially in its new stadium. The Bulldogs have never won a playoff game so they can carve some notches on the record books, if successful. 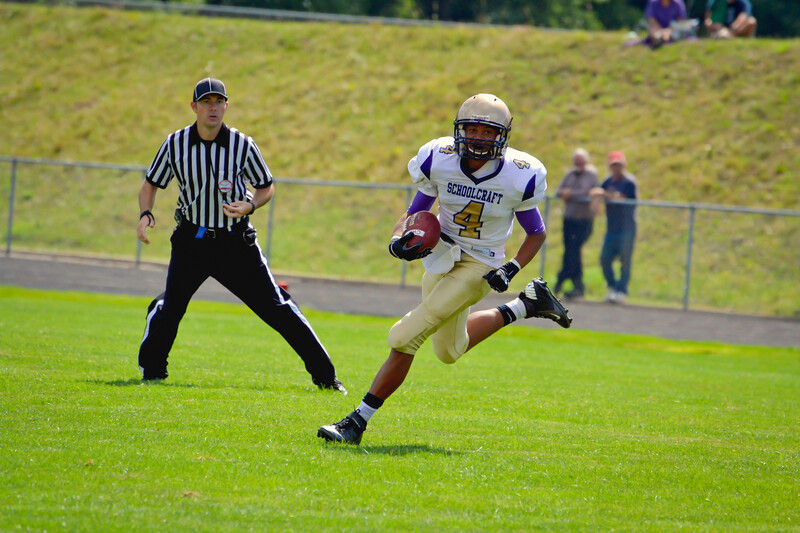 They lost to Three Rivers in regular season play 25-6 in a game that could have been much closer if the team hadn’t suffered a letdown in the fourth quarter when Three Rivers marched down the field in quick succession to score two touchdowns. Having another chance to avenge the loss was important to the team as they gathered to watch the pairings by the Michigan High School Athletic Association on Fox TV, Sunday night at Angels Crossing club house. Vicksburg is in Division 4 and would face the winner of the Paw Paw/Edwardsburg game in the district finals, should they be able to pull out a victory over Three Rivers. 2014 is an election year with the main ones being the race for governor and senate. The South County News has prepared statements from the many candidates running for local offices and three campaigns for state house seats. These contests typically do not get much attention from the media, but they actually directly impact the daily lives of those who live and work in the south county area. The November 4 ballot is rather lengthy and voter turnout is critical in local races, such as Schoolcraft School Board, and the state senate ballot where a lot of money is coming in from outside the district. The senate race pits Margaret O’Brien, originally from Fulton, with a Kalamazoo City resident, both of whom are state representatives now. O’Brien has worked tirelessly for Vicksburg through some of its roughest days when the village needed the state to back off and take a more collegial view of its debt restructuring. The newspaper has offered all of the candidates for village council posts, school board, county commission, state representative, and state senate a chance to state their qualifications in 100 words or less and submit a photo of themselves so voters might recognize them as they campaign door to door in the waning weeks of the campaign. Sean McCann, Democrat – State Senate 20th District which encompasses all of Kalamazoo County I want to serve Kalamazoo County in the state Senate because I believe in the value of public service. I have served our community first as a student leader, then neighborhood director, city commissioner and now state representative. I love this community, and I want to serve all the residents of Kalamazoo County and advance my top three priorities of quality education, economic development and excellent constituent service. I believe that through quality education from pre-K through college or trade school, we can develop a talented workforce that will attract new companies and new jobs to Michigan. My name is Sean McCann, and I am asking for your vote this November. Margaret O’Brien, Republican – State Senate 20th District which encompasses all of Kalamazoo County Growing up on a dairy farm, I learned the value of hard work. And as I de-tasseled corn and put myself through college, I experienced firsthand how important it is to have a can-do attitude. The past four years, I have taken my experience of small business, community volunteerism and family to work for you. As your senator, I will bring my bipartisan leadership, can-do attitude and work ethic to continue Michigan’s recovery. I grew up on dairy farms in Pavilion and Texas Townships, the third of four children (three brothers, only girl). I currently live in Portage, am married to Nick, and am the mom of two college students: Tyjon and Samantha. I have been a social worker at Catholic Charities, a real estate agent with RE/MAX Advantage, a Portage City councilwoman, eight years, and state representative, four years. Lorence Wenke, Libertarian – State Senate 20th District which encompasses all of Kalamazoo County I am the Senate candidate with the most government experience and most private sector experience. Legislators influence the direction of state government. My real world experience demonstrates my proven success in job creation in the private sector, and my 14 years in elected office show a record of leadership, courage, and responsiveness to citizens. Wenke Greenhouses has four locations in two states and employs 200 people. I have experienced public policy on the front lines. As chairman of the Kalamazoo County Board of Commissioners and as a state representative for six years, I learned the importance of good governance and the impact that government has on the lives of all citizens. Bill Farmer, Democrat – State Representative 63rd District which encompasses Brady, Pavilion and Wakeshma Townships I am a candidate for this office because Lansing politicians are not representing working families’ values. They have mistakenly given huge tax cuts to large corporations and the very wealthy, hoping this would create jobs. This money was taken away from our children’s education, retirees, and low income and working families. This is unfair and it didn’t create jobs. Many of these large corporations do not pay their fair share of taxes. I am committed to breaking the cycle of poverty, preparing our children to be successful in school, decreasing our state’s prison population, and creating a healthy environment and sustainable economy with growing opportunities for our families. I will do this by deeply investing in our public education. I will represent you and invest in our communities. I know what it means to represent the values of working families. Dave Maturen, Republican– State Representative 63rd District which encompasses Brady, Pavilion, and Wakeshma Townships I feel the time is right to take my local legislative experience to the state level. For over 26 years, I’ve had the privilege of serving the South County, first as Brady Township Trustee and then as a Kalamazoo County Commissioner, where I’m currently board chair. My approach has always been to look to the future, and not kick the can down the road. As a county commissioner, I’ve led legislation to reduce government debt and rein in legacy costs, easing the burden on our future generations. I look forward to bringing this approach to Lansing and to representing the people of this great community. John Fisher, Democrat – State Representative 61st District that encompasses the west side of Kalamazoo County I am running for state representative to bring to Lansing responsible, thoughtful leadership that works for the common good. As a local church pastor for the past 37 years, I have been privileged to serve people through the fullness of their lives, from baptisms, birthdays, graduations, weddings and funerals. I have stood with and for diverse groups of people to advocate their issues, and I am here to bring my spirit of collaboration. We must work together to reinvest in education, to rebuild our roads and bridges, and to ensure that we work together to focus on the common good. Brandt Iden, Republican – State Representative 61st District which encompasses Schoolcraft, Prairie Ronde, Townships and Portage. What I’m hoping resonates with the voters of the 61st District is my commitment to service. As a four-year Kalamazoo County Commissioner, I’ve served the people of this region by working hard to protect their interests and values. In the nonprofit community, I served with Big Brothers/Big Sisters for six years and I currently serve Junior Achievement of SW Michigan, championing enrichment programs for our area youth. As a small business owner, my goal is to serve my customers’ needs each and every day. Now, I look to take this spirit of service to the Michigan House of Representatives. I look forward to serving you in Lansing. Michael Stampfler, Libertarian – State Representative 61st District I am a life-long resident of Michigan and grew up on the family dairy farm in Barry County. After attending Hope College, I received two master’s degrees from Western Michigan University. I began my 35 year career in public administration at the City of Kalamazoo where I served as Airport Director and City Clerk before serving as city manager of Portage from 1985-2005. I was appointed by Governor Granholm to serve as Emergency Financial Manager of Pontiac in 2010-2011. I am married to LuAnn and have three children all in the U.S. Military: Capt. Abigail Stampfler Vincent, Lt. Michael Stampfler II and LtJG. Jeremiah Stampfler. I believe I can help the state of Michigan face the difficult issues ahead. Bret Willis, Democrat – Kalamazoo County Commission – District 8 I am a lifelong Schoolcraft resident, graduating from Schoolcraft High School in 2000. I have two bachelor’s degrees from Western Michigan University. One is in marketing, the other in education with a political science background. I have proudly served on the Schoolcraft Village Planning Commission since 2009. Since I have grown up and lived in this area my entire life, I possess a great amount of pride for the area and its residents. I hope to win election to this seat so that I can help make the areas of my district a great place for folks to call home. I also feel that it is important that we build upon our great traditions and pride in our towns, yet continually be open to growth and improvements. It is an honor to be running for Kalamazoo County Commissioner for District 8. John Gisler, Republican – Kalamazoo County Commissioner – District 8 which encompasses Pavilion, Brady, Schoolcraft, and Prairie Ronde Townships I served as a county commissioner for two years, in 2011 and 2012. My guiding principles are limited government, personal responsibility and individual liberty. I’ve been a Pavilion Township resident for 38 years and have been married to Gail for 48 years. We have two grown children and four grandkids. My 14 years as a manager with budget responsibilities coupled with an MBA in finance from Syracuse University will enable me to help keep Kalamazoo one of the most fiscally sound counties in the state. The county commission will be challenged to balance budgets in the face of an anemic national economic recovery. This must be done without raising taxes. As your county commissioner, I will limit government intrusion into our daily lives and encourage personal responsibility and individual freedom. I will scrutinize every expenditure of taxpayer dollars. Larry Provancher, Democrat – Kalamazoo County Commissioner – District 10 which encompasses south entral Portage I was born in and lived in the U.P., graduating from Lourdes High School in Marinette, Wi. I continued my education at Western Michigan University earning a BA and MA in political science. I also did postgraduate work at Bradley and Michigan State Universities. I started my 36 year teaching career at Otsego High School, for three years and then spent two years at Colegio Bolivar, Cali, Colombia, S.A., and then 31 years in the Portage Public Schools. Two years after retiring from teaching, I ran for the Kalamazoo County Board of Commissioners, won and served three terms. After that, I served several terms on the Community Mental Health Board. Most recently, I have worked on projects in Guatemala, El Salvador, and Mexico and have worked with the Michigan Organizing Project and Michigan United on social justice issues. Stan Runyon, Republican – Kalamazoo County Commissioner – District 10 which encompasses south central Portage I have many years of experience taking care of the funds of business entities in both the manufacturing and construction industries. I am a long standing member of the Institute of Management Accountants. I am active in the Kalamazoo County Republican Party and and the treasurer. I have been married to my wife, Sharon, for 42 years. We have three adult children and four grandsons. The purpose of the County Commission is to oversee the business of the county. My business background qualifies me to execute that fiduciary role on the County Board in a fiscally sound and pragmatic fashion, and to be a responsible steward of citizens’ tax dollars. Jamie Jager, Democrat– Kalamazoo County Commissioner – District 11 which encompasses southeast Portage My campaign for Kalamazoo County Commissioner for District 11 is based on my love for the community I have lived in my whole life and the impact I want to make for its residents. I have a bachelor of political science degree with a public law concentration and a minor in psychology. That, along with my experience as a small business owner and my ties to the community, makes me a prime candidate. I want my campaign to be less about political affiliation and more about improving our county for all demographics and citizens equally, with bipartisan cooperation. Scott McGraw, Republican – Kalamazoo County Commissioner – District 11 which encompasses southeast Portage My experience as a small business owner for nearly 20 years, coupled with my involvement in the local community, gives me the vision and depth of knowledge to help the county commission through a transition where at least six of the 11 commissioners are leaving. I am involved in many local and school groups, including Portage Rotary, Love INC, Farm Bureau, the Mustang Association and PCHS Football Boosters. As I have attended all the commission meetings this year, I’ve noticed several things that I would like to see addressed. One is to see increased communication and transparency from the commission. The citizens deserve the right to know how their tax money is being spent. Secondly, I would like to see all opportunities explored before we consider adding taxes. The 911 dispatch consolidation is a prime example. Consolidation should save money and adding a surcharge to everyone’s cell phone bills should be an absolute last resort. Finally, I would like to see innovative ways to encourage cooperation among departments and units of government. James Earl, Vicksburg Village Council My career experience with two large corporations has taught me the importance of fiscal accountability and teamwork. Since my appointment to the council in February, I have tried to help the team in any way possible. Even a small village like Vicksburg has many different important departments or subcommittees that must properly function to attain success. This takes a well-functioning team to build consensus on what is best for the village. We have a great team in place now and everyone is taking an active role in various portions of the Village. Let’s keep up the momentum. Karen Nay, Vicksburg Village Council I am a write-in candidate for the Vicksburg Village Council. For me to be elected, voters need to write “Karen Nay” under the Village Council section on their ballot. I have lived in Vicksburg for five years and in Michigan for most of my life. I graduated from WMU with a master’s degree in social work with a focus on policy, planning and administration. At Family & Children Services and at Hospice, I worked with people from all walks of life and in all sorts of situations. I know how important the coordination of government programs and resources can be to individuals and communities. I am now self-employed, with my main focus being to locate rare and antique books throughout southwest Michigan and work towards their preservation by museums, libraries and collectors. I care about Vicksburg and feel I have a lot of offer. Ron Smith, Vicksburg Village Council I am a Vicksburg native and the third generation of my family to have served the Vicksburg community. Since my appointment to the council two years ago, I have been actively involved in efforts to return Vicksburg to fiscal health and the expansion of business, employment, recreational and cultural opportunities. I have applied my professional skills to issues as varied as compliance with village and state laws, employee salaries and benefits, utility billing, and reorganization of administrative units. Thanks to the tireless efforts of the current council, Vicksburg is on the move. I hope to continue contributing to that momentum. Julie Merrill – Vicksburg Village Council I am the owner of Rawlinson’s Appliances with a loft above. I am a fifth generation Vicksburg resident. I have a bachelor’s degree in business administration from WMU. I served as chair of a governmental pump augmentation project for the Long Lake Association board. I am a board member of Vicksburg Historical Society and the Vicksburg District Library. Serving on the Village Council is a serious undertaking. I bring over 14 years of experience working on local boards, partnering with the community, the county drain office, Pavilion Township, City of Portage, the DNR, attorneys and engineers. I’ll be an objective listener and active representative working to address health, wealth and safety issues for our village to benefit the village under federal and state law. I will be an active representative working for our village residents and businesses in work sessions, committees and public meetings. I have an excellent attendance record and work ethic and am a fair listener. David Schriemer M.D. – Vicksburg School Board I have completed two terms as a Vicksburg School board member. I am married to Paula and have three children, two of whom have graduated from Vicksburg Schools and one currently in Vicksburg High School. I served one term as trustee for the Vicksburg Community Schools Foundation and through the years have mentored five different elementary boys in the Kids Hope program. Since joining the community in 1989, I have donated time to providing sports physicals for Vicksburg athletes. Deborah Harsha – Vicksburg School Board I am a Battle Creek native and Vicksburg resident for 20+ years seeking election to the Vicksburg School Board. My history of community involvement has been largely family and child focused including teaching Sunday school, being a PTA board member at Sunset Lake Elementary, teaching more than 20 Junior Achievement classes for 10 years, and serving as a member of the Vicksburg Community Schools Foundation. I work locally in the field of procurement/supply chain and am an active member of the Institute of Supply Management (past membership chair and president) promoting education in the field of supply chain management. I am married to Mark Harsha and we have two children in the Vicksburg School system. When not busy with work, children and volunteering, I am busy with My Cheese, Inc., the manufacturer of Vicksburg Cheddar Spread. Wil Emmert – Vicksburg School Board I have served over 20 years as a VCS board member and am once again excited to seek reelection. Recently retired from Western Michigan University as a grant administrator, I have lived in Vicksburg for more than 40 years. My wife and I have two children who attended VCS from kindergarten through graduation. I have long been interested in and knowledgeable about education. Both of my parents were educators as was my wife. When an opportunity presented itself to serve on the board, it seemed like a logical step. The biggest challenge I see continues to be providing a full and all-encompassing education with the funding provided by the state, in addition to meeting ever-changing requirements. Our continued commitment must be to prudently find the means to meet all the district’s needs in responsible ways. Favorite moments on the board certainly include handing out diplomas to graduating seniors knowing that these students are prepared to meet their future. The South County News and the Schoolcraft Parent Teacher Organization (PTO) are co-sponsoring a Schoolcraft school board “Meet Your Candidates” night on Tuesday, October 21, at 6 p.m. in the Schoolcraft Library’s community room. There are three seats up for election and five candidates who have all promised to be present to answer questions from a moderator and meet the public afterwards for a social hour. Two of the candidates are incumbents, Kathy Mastenbrook and Jeannette Marshall. Three others running are Ryan Ledlow, Steve Sutton, and Jason Walther. Two long-time members of the school board, David Krum and Skip Fox, chose not to run for the six year term. Returning members not up for re-election are Darby Fetzer, Matt Devoe, and Mike Rochholz, board president. All the candidates have been involved in the school district in various ways. During the event, there will be an open discussion of how each candidate proposes to take the school district in one direction or another, according to Bobbie VanZile, PTO president. It will be a question and answer session with each person given a set amount of time to give his/her answer. The moderator will be Sue Moore, editor and publisher of the South County News. The public is encouraged to attend and judge for themselves who is best qualified to lead the school district for the next six years. Kathy Mastenbrook – Schoolcraft School Board My husband Mark and I have been married for 25 years and residents of Schoolcraft for 23 years. Our sons Aaron, 25, and Collin, 20, are graduates of Schoolcraft Community Schools. I have served on the Board of Education for 17 years and have been involved in the Friday Backpack program for the past five years. I have a bachelor’s degree in accounting and am currently employed with Ayres-Rice Insurance. I am running for the Board of Education because I have a passion for education, and truly love serving the students and families of Schoolcraft. I believe that a strong school system promotes economic growth and is vital to our community. Schoolcraft Community Schools educates and empowers students to be successful in life. My desire is to enact and enhance policies that continue to move our district forward and promote student achievement and success. Jeannette Marshall – Schoolcraft School Board My husband Dan and I have been married for 23 years and have lived in Schoolcraft for 20 years. We have two sons: Jacob, 20, who graduated from Schoolcraft and is now a junior at WMU, and Adam, 17, who is a junior at Schoolcraft High School. I am currently an office manager at a dental office in Portage. I attended Tift College and Georgia State University. I have served the last four and a half years on the Schoolcraft School Board. During that time, there have been many positive changes. We hired a new superintendent and new administrators in the early elementary/elementary, middle school, and high school. We have realigned our mission/vision statement and district goals. The addition of Data Wise, AP and STEAM classes have intentionally advanced the accountability and rigor in our curriculum. We’ve integrated key programs designed to empower students socially and educationally, which include “Leader In Me” at the elementary and “Capturing Kids Hearts” in the middle school and high school. With the recent procurement of a grant, we’ve been able to keep pace with neighboring districts by adding one-on-one technology in the high school this year. Jason Walther – Schoolcraft School Board I am an experienced and passionate leader who believes in delivering excellence through great teams. I lead a successful multi-state fourth-generation family farm. My wife and I moved to Schoolcraft for one reason, the schools. Jen is a teacher who currently stays at home raising our five young children. My interest in seeking election is for our kids. We must educate and equip our children to succeed in this rapidly changing world economy. I love tradition and small communities. I am committed to listening to you and representing our collective interests if I become an Eagle board member. Ryan Ledlow – Schoolcraft School Board I am a 1993 graduate of Schoolcraft High School. I received a BA in history and secondary education after attending MSU, KVCC, and WMU. I have a master’s degree in education from Marygrove College. I served 16 years as a classroom teacher. I have coached football, basketball, and track at various levels for the past 20 years. Wife: Kyla Ledlow. Sons: Caleb Piper a senior at Schoolcraft High School, and Riley Piper, a freshman at Schoolcraft High School. I have a deep commitment and gratitude toward Schoolcraft Schools and the people of Schoolcraft. It began in my elementary years as a water boy for my Dad’s football teams, but as I grew up, I began to grasp what truly makes Schoolcraft and our schools such a special place. As a student-athlete, and eventually as an employee of Schoolcraft Schools, I can’t help but realize the immense dedication of not only the teachers, coaches, administrators, and staff of our schools, but also the care and passion of the people in our town toward our school system. I hope to return the favor and be a worthy representative of our community as a member of the Schoolcraft School Board. It is time to do my part, and help continue the tradition of excellence at Schoolcraft Schools. Steve Sutton – Schoolcraft School Board I am excited to be running for the Schoolcraft School board. I am a 1990 graduate of Schoolcraft Public schools and look forward to seeing my kids graduate from Schoolcraft as well. My family and I currently live in the village and enjoy the convenience of being near the schools and my job. As the owner of a small business, I have always embraced the efforts that are made from everyone’s contributions. I consider myself to be patient and courteous and most of all, a great listener. I plan to represent the community openly and honestly with patience and be a voice of reason for our historically great district. Todd Carlin – Schoolcraft Village Council My wife, Kymm, and I moved to Schoolcraft in 1996 because we liked the pleasant small town atmosphere and the good schools for our two children. We have enjoyed living in this family-oriented community, and have met many wonderful people. We both like to give back to our community. I chose to run for the Village Board as a way to serve the people of the village, and as a way to be involved in issues that I care about such as the village sidewalk program and the South County Fire Authority. If there is one thing I could change, it would be to have more people show an interest in our village government. Mike Rochholz – Schoolcraft Village Council I have served on the finance, policy, and curriculum committees to name a few. Prior to serving on the school board, I was involved with PTO, and served as president for three of those years. I was also actively involved in Junior Achievement, Project Charlie, Project Graduation, Teacher Appreciation, helping in the classroom and more. My background in local government, educational boards and public service is extensive. As for local government, I have served as the clerk of Prairie Ronde Township for four years, and have also served on the Zoning Board of Appeals for Prairie Ronde Township, Schoolcraft Township, and the Village of Schoolcraft. I am currently serving the Village of Schoolcraft as an appointed council member. I have completed a Michigan Political Leadership Program Fellowship at Michigan State University, and understand the interactions and connections of all facets of government, and how all of those connections may provide opportunities for possible consolidation of services, growth, and strength of organizations. Additionally, I currently serve in educational leadership roles as a local school board member and board president in my fourteenth year with Schoolcraft Community Schools, and as a Board Director for the Michigan Association of School Boards. Scot Dailey – Schoolcraft Village Council My wife and I have lived in the village since 1989. We moved here because we liked the small town feel of Schoolcraft and its history. My wife and I enjoy the friendly people, and the small town shopping opportunities. I have always had an interest in local government, and in 2002, I stepped in to fill a vacant seat on the Village Council, and have served on it ever since. In the 12 years that I have served, I have seen many positive improvements in the Village including the streetscape project, improvements to Burch Park including new playground equipment, infrastructure improvements including the removal of the water main on Grand Street to the west side of the street, and many major street projects. Most of these projects were funded by grant money making them even better projects for all of us to enjoy. Serving on the board has given me the opportunity to become more educated in municipal operations, and created a greater understanding of our operations. Decisions that are made at the council level are not always easy, but they are made with the intention of providing the best possible services and programs to the community. I am Dorothy J. Clark, a Schoolcraft resident for 47 years. My three children graduated from Schoolcraft High School. I was a bookkeeper for 40 years. Since retirement, I have served as meal site coordinator at the Community Center for four years. I’ve been a hospice volunteer for seven years, and I’ve served on the Village Council the past five years. I am running for a second term as village trustee because I care what happens in our village and to have a share in the decisions affecting our community. Keith F. Gunnett – Schoolcraft Village Council President I have lived in the Village of Schoolcraft since 1979. My wife and I chose to live here because we liked the small town feel of Schoolcraft. We were impressed by the friendliness of the community, and wanted our children to attend Schoolcraft Community Schools. In 2002, I became a member of the Village Council serving as village trustee. In addition to serving as trustee, I have and still do serve on a variety of committees including the Planning Commission, the DDA, South County Sewer and Water Authority and many more. I consider it an honor to serve as Village President, and I am committed to making decisions for the community in the best interests of the business and residential communities in all matters that are presented to me. Photo by Stephanie Blentlinger, Lingering Memories Photography. Schoolcraft brought home a big win, 28 – 7 against Kalamazoo United last Friday against a team that was undefeated and ranked number 5 in Division 5. The wizards at MLive had picked United over Schoolcraft previously. 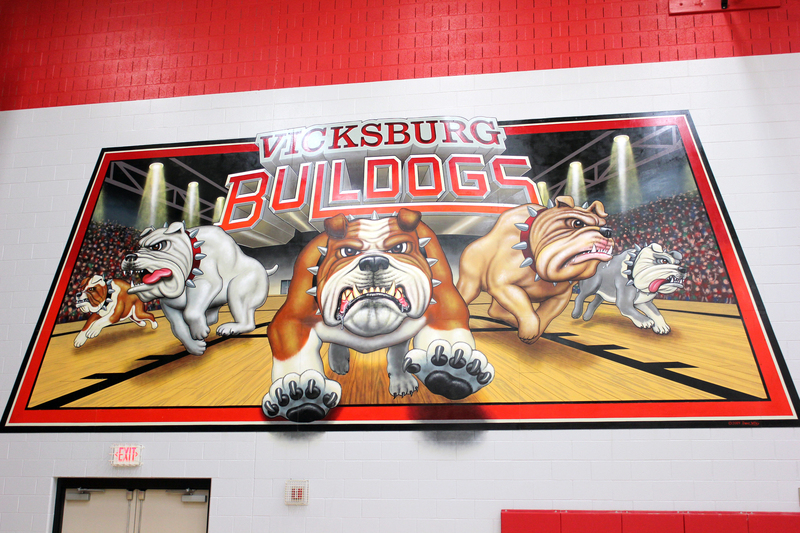 A Bulldog wall mural, freshly painted walls, new wall pads, and new scoreboards are among the improvements in the Vicksburg High School gym, the gym’s first facelift since its construction in 2001. The improvements are the joint effort of the Vicksburg Athletic Boosters, the Vicksburg Foundation, and the Vicksburg Athletic Department. The Boosters contributed 60 percent of the $50,000 price tag, with the Foundation and the school each contributing 20 percent. The massive Bulldog wall mural was done by Dave Wiley of Wiley Wall Graphics of Atlanta, Georgia. The stunning feature-wall is framed by freshly painted walls, as well as the addition of new wall pads. The new scoreboards have upgraded features including the ability to list player numbers; kills and digs for volleyball; fouls and points scored for basketball; as well as wrestling statistics. The enhanced scoreboards are complemented by new score tables. All of these improvements are capped off by the display of a new American flag. Jim Mallery, Vicksburg Athletic Boosters President, is proud of the role the Boosters have played in this shared endeavor, noting that the facility is used by basketball, volleyball, wrestling, and competitive cheer, as well as for school and after-school activities. The gym has also been used recently for district and regional events, showing the far-reaching benefit of these improvements. Future improvements planned include having the floor resurfaced next year at an anticipated cost of $40,000, to be accomplished through Booster fundraising. Three years ago, $25,000 was put into a new sound system in the gym. 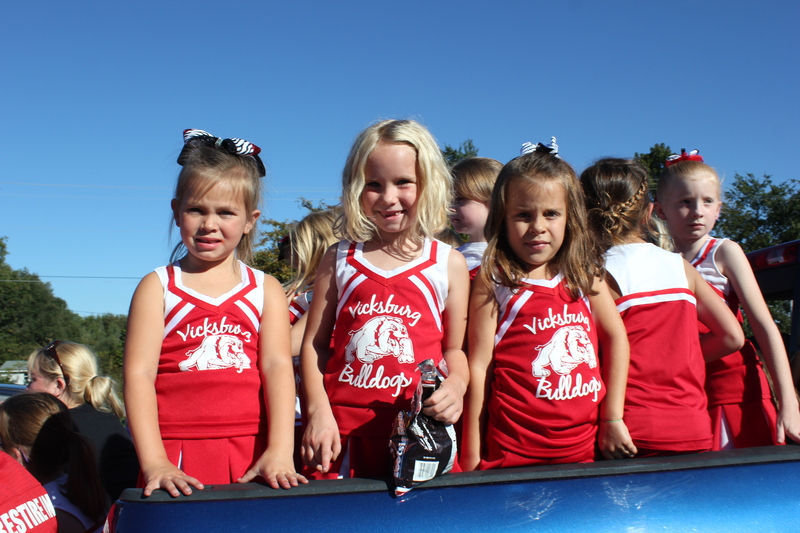 The Little Bulldog cheerleaders will be cheering at the October 11 final event of the season. To celebrate the winning success of the teams in the Vicksburg Youth Football program, everyone is invited to attend the last home games of the season on Saturday, October 11, at Vicksburg Stadium. Five games are scheduled that day starting at 2 p.m. and ending with an 8 p.m. kickoff for the night game under the lights. To help engage the community, Kip Young and Josh Baird, the youth leaders, are inviting organizations to attend. Their goal is to get as much community support for the Vicksburg youth football players as possible for the last games of the season.